Which is the seventh day - Saturday, lunar Saturday or Sunday? We are able to determine exactly which day is the seventh? It would make sense that God has appointed a day as a memorial of His creative power - a special day when they all adore him and when to rest and then it clearly has not revealed what day is it? There are three ways can be determined that the seventh calendar day is Saturday. First look at the Biblical evidence. The Bible clearly shows. In Luke 23 we have been reports of Christ's crucifixion. When Luke writes about the day when Christ died, says in verse 54 that was started Friday and Saturday. Furthermore, it says that women maintain calm on Saturday. Luke writes for three consecutive days - the first day of Preparation Day (Friday), the next day, Saturday - a day when women rested. The third day, the first day of the week - the day of resurrection. Luke 23,54-56,24,1 - it was a day of preparation, and neared the start Saturday. Added to him and women who came with Jesus from Galilee. They saw the tomb and how his body was buried. They returned home and prepared spices and ointments oil, but then retaining the commandments Sabbath. Early morning on the first day of the week took the prepared spices and went with other women to the grave. The Christian world is essentially the same as that which Christ died on the day and called it "Good Friday". And what about the day when Christ arose? Christians around the world celebrate "Easter Sunday". So the day when Christ died on the Friday, the day when Christ was in the grave - Saturday and the day got - Sunday. Saturday is the day between Friday and Sunday. We can easily compute: If Sunday is the first day, then Friday and Saturday is the sixth seventh. 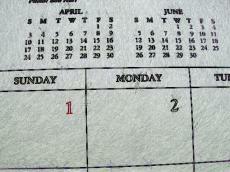 (In European countries have until Sunday the 20th century changed the seventh day of the week). If you ask any Jew will tell you that the day of preparation is the sixth day - Friday, so it confirms that Saturday is the seventh. The dictionaries we find an explanation of the slogan Saturday: "Saturday is the seventh day of the week" (Websters Dictionary Standard). In fact, the word appears Saturday in 108 languages ​​worldwide. In Portuguese and Spanish "sabbado" in Russian "subbota", in Bulgarian "šubuta" in Arabic as-SABT. Languages ​​of the world bear witness to the great and glorious fact that Saturday is the seventh day of the week. Have you ever watched the calendar, so you figure out which day is the seventh? Until recently in our calendars (and still see it in some calendars in the country) it was Sunday - the first day, Monday second Tuesday, the 3rd, Wednesday fourth Thursday, the 5th, Friday, the 6th and Saturday the seventh day. It was always like this? Whence comes this weekly cycle? From the Sun - Sun, Sun controls the annual cycle. From the moon? Sun, the Moon is in charge of monthly cycles. And what country, which rotates around its axis? No, the country the daily cycle. 1st What happened to your weekly cycle stability studies since ancient times? 2nd Influenced by changes in the calendar (the Julian to the Gregorian ...) weekly cycle in some way? 3rd It continues Saturday in our time series intact, seven days a Saturday, which the Bible speaks in the context of the crucifixion? Dear Sir, I was forwarded your letter to the Royal Greenwich Observatory, and the director asked me to answer you. Continuity of the seven-day week is maintained since the early days of the Jewish religion. Astronomers can only deal with what relates to the determination of the time, dates and the years. But as the week's civic, social and religious cycle, there is no reason why there should be a breach of the calendar. Any attempt on the calendar ran into strong opposition of Jewish leaders. We are confident that no such breach has not taken off. Change the Julian to the Gregorian calendar (1582 - 1927) was designed so that when it has not violated the weekly cycle. Evidence of the Biblical history of the world's languages ​​and astronomy are clear. Saturday is the Bible today, the calendar Saturday, it's the seventh day of the week, the holy Jesus Christ! Saturday the seventh day of the week maintaining the old Israel, but also the Apostles, the early Christians, and especially Jesus Christ. Jesus Christ is our model and he maintained a Sabbath as the seventh calendar day from the time of Jesus Christ has not changed. It is therefore our primary evidence, why is the right calendar Saturday day of rest. Jesus Christ is a proof and a landmark, because if the people bad holy day, he would fix it and pointed to what is right. Jesus Christ, but it is not even a lunar sabbatize Saturday, but his life confirmed Saturday according to the calendar, which until today has not changed! Just the day the Lord comes to meet you, waiting for your presence and desire to meet you. Not on Friday, Thursday, Sunday, but it comes at us on Saturday! How sad that most Christians are coming on Sunday, when God has already left. Another milestone we can see the testimony of Ellen Gould White, which clearly confirmed the importance of God ordained day of rest on Saturday and even according to the calendar that the holiday starts on Saturday evening. God, through her first adventistům confirmed that this day is truly Biblical and rising-again consecration of true rest and spread this knowledge throughout the world. Matthew 16,11-12 - Beware of the leaven of the Pharisees and Sadducees, "then realized that they were told to avoid yeast bread, but the Pharisees and Sadducees learning. Matthew 23,13-15 - "But woe unto you, Pharisees and experts from the Scriptures! Hypocrites, closing the kingdom of heaven before men! There nevcházíte themselves and those who want to join, you defend! Woe to you experts scriptures and Pharisees! Hypocrites, compass sea and land to make one man turned to faith, and when I get it, do it twice more damned than yourselves! 2nd Timothy 4.2 - proclaim the word, be prepared in season and out of season, reprove, exhort, encourage, and teach with the greatest patience. Indeed the time will come when people will not tolerate sound doctrine, but will suit your taste surrounding the teachers who will tickle their ears. Turn away their ears from the truth and resort to myths. Revelation 2, 15-16 - Similarly, you're learning Nicolaitanes partisan. Therefore repent. Otherwise, I come to you soon and I will fight against them with the sword of my mouth. MP3 - Call - $ 1000 for a single verse in the Bible showing the observance of Sunday. AmazingHope.net - Which is the seventh day - Saturday, lunar Saturday or Sunday?